Our next Friday Showcase is 7 April and we are delighted to welcome Daiva Ceicys, who will share her quilting journey. Daiva is a QuiltNSW Accredited Teacher and tutors in the Far South Coast, sharing skills developed over thirty years with quilters’ groups and patchwork stores in both coastal and more remote country areas. 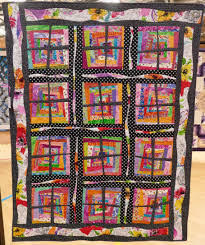 Daiva combines modern and traditional techniques in a wide variety of quilts. Friday Showcase is held at our office (Level 5, 276 Pitt Street, Sydney) and starts at 10 am. Visitors are most welcome so bring a friend along. $5 for members and $10 for visitors.